Petersen is open and candid in talking about his feelings of devastation, anger and grief as the brain altering disease Early Onset Alzheimer’s takes control and dominates every area of life in a downward spiral unpredictable and all consuming. He tells of the private agony of loneliness, overwhelming feelings of depression, and the ongoing battle with exhaustion. The pages are filled with personal experiences, correspondence with family and friends, advice from medical professionals, fellow travelers, and well-meaning acquaintances. In this dramatic story Peterson provides the reader valuable information and helpful hints for fellow travelers on their journey with Alzheimer’s. New perspectives on the reality of day to day life and the growing sense of loss, a sense of discovery into the little windows of the Disease and the realization of being increasingly alone. Help to cope with the sense of isolation, loneliness, denial and the delusion of normalcy or improvement. The dangers of ignoring a growing awareness of the results of Caregiver stress. How to deal with times when it seems that all dreams are ending. And the realization that I am not alone in this journey. There were times in my reading when my tears blurred the print or when I just stopped reading to reflect on our own journey with Alzheimer’s. Reflective moments recalling cherished memories of those days that pre-date the realization that building memories for “us” was in reality building memories for me. Resource suggestions and discussion questions are provided for further reading, personal contemplation or for group discussion, ideal for use in a reader’s or support group. A beautiful story, of love, trauma, renewal, and hope. Laurie Wallin knows from personal experience the challenges faced by families with special need kids. 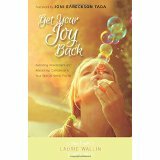 “Get Your Joy Back” is her story.Wallin is candid and transparent; willing to be honest and expose her own vulnerabilities when she talks of the reality of parenting special needs children. She discusses the issues of resentment, the intensity of multi-tasking and the impact of this on siblings and other family members. Practical themes covered in the fifteen chapters of the book include: Forgiveness of yourself, your child, your spouse, your extended family, the professionals, the church and community, and forgiving God. Wallin is a gifted communicator, a professional life coach with a passionate heart, is empathetic with her readership and knowledgeable in the area of special needs parenting.